Result: Glenavon 1-1 Ballymena Utd. 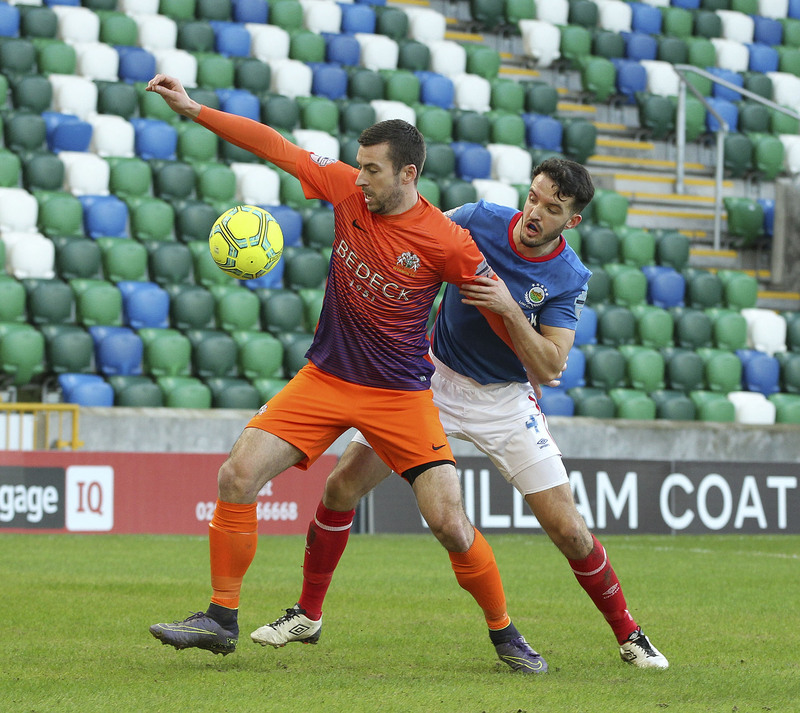 Home/Match Report, Premiership/Result: Glenavon 1-1 Ballymena Utd. Mark Sykes starts up front with Kevin Braniff. Declan O’Brien picked up an injury during the warmup so Simon Kelly replaced him on the bench with Kris Lindsay as Gary Hamilton found his options severely limited. Mark Sykes played up front. Photo by Alan Weir. 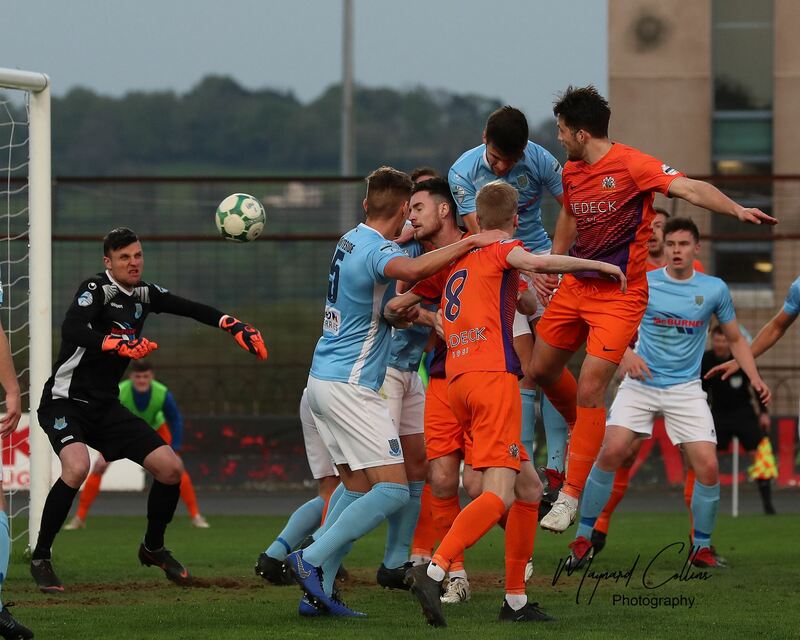 Glenavon dominated the opening exchanges but Ballymena went ahead against the run of play in the 32nd minute from their first corner of the game. David Cushley rolled the corner back to an unmarked Tony Kane and his cross glanced off a couple of heads before dropping to Johnny Taylor who side-footed the ball in from six yards. The home side had the ball in the net five minutes earlier after Alan Blayney dropped a cross but the Referee generously awarded a free kick out. Joel Cooper gets a shot on target. Photo by Alan Weir. 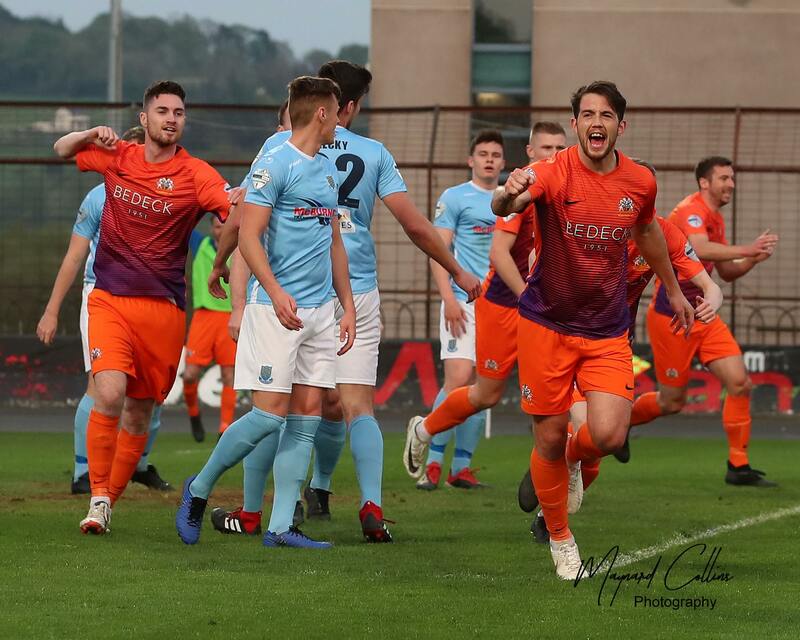 Glenavon levelled in the first minute of the second half when Ciaran Martyn stabbed home from close range after Blayney could only parry David Elebert’s close range header from a corner from Joel Cooper. Ciaran Martyn celebrates after scoring the equaliser. Photo by Alan Weir. 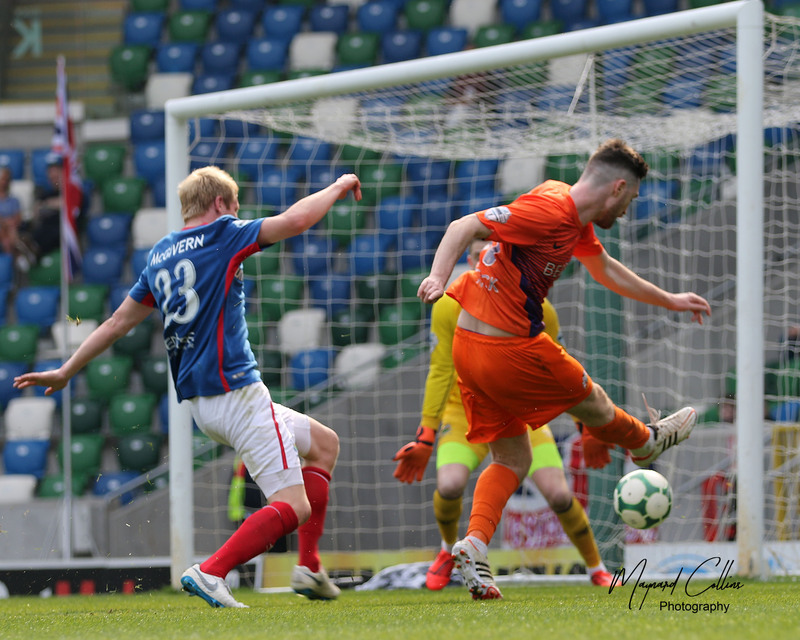 Supporters and players were left wondering in the final minute how Glenavon didn’t manage to get the ball in the net following a disputed corner. Cooper sent it over and after the ball was only cleared back to the winger it was pumped back in again and somehow scrambled off the line. Martyn stabbed it goal wards but it hit the post and then rebounded off Blayney before eventually being cleared. David Elebert clears the danger. Photo by Alan Weir. On a night when Gary Hamillton was without the services of three strikers including himself, Eoin Bradley and Declan O’Brien not to mention Daniel Kearns, a point is no doubt welcome at the end of the day. Glenavon: Tuffey, McGrory, Dillon, Elebert, Marshall, Hall, Martyn, Kilmartin, Cooper, Sykes, Braniff. Subs: Lindsay (Hall 87), Patton (Sykes 74), Kelly, Marron, McGrath. 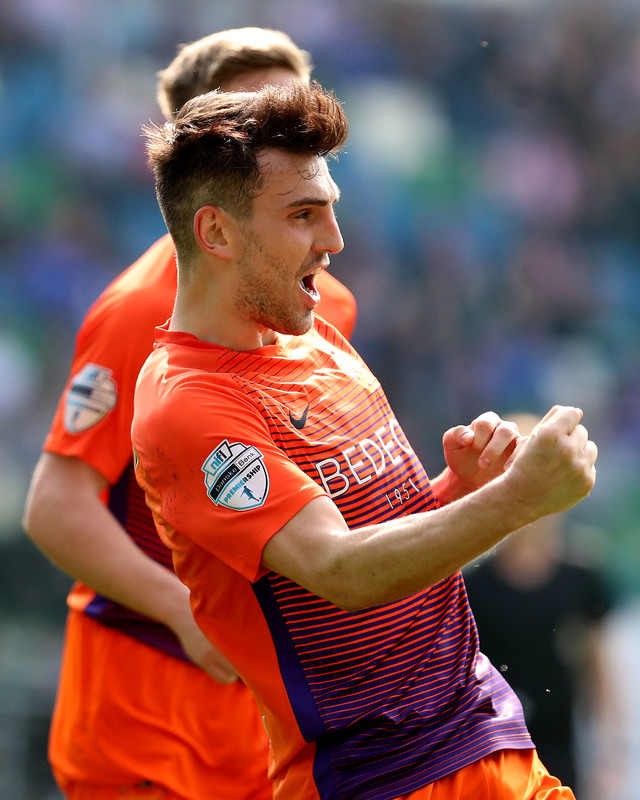 By Webmaster|2016-04-05T19:50:18+00:00April 5th, 2016|Categories: Match Report, Premiership|Comments Off on Result: Glenavon 1-1 Ballymena Utd.